Venison can have a strong, gamey flavour and is ideal used as an unusual substitute for beef. It also has the advantage of being a particularly lean red meat. As such, it can be used to create indulgent, hearty, traditional dishes that are still healthy and nutritious. If served as steaks or sausages, venison is surprisingly simple to cook, making it a perfect option for dinner parties and special occasions. Whether you choose to try out venison steaks with redcurrant sauce, or venison bangers and mash, you’re sure to enjoy cooking with fresh ingredients from the heart of the countryside. Venison steaks are easy and quick to cook. They are traditionally paired with flavours such as blackberries, redcurrants, wine and juniper, making them an ideal rural dish. This unique twist on the classic British dish is ideal to serve at a dinner party or for a special occasion. The perfect balance of informality and something a bit special, guests will enjoy tucking into this gamey version of the comforting country pub staple. Venison sausages are readily available from local butchers and farm shops; a rural treat that even city dwellers can get their hands on with ease. Remember that these recipes should serve only as an initial guide. The joy of cooking with venison and other rural produce is the opportunity for experimentation and variation. 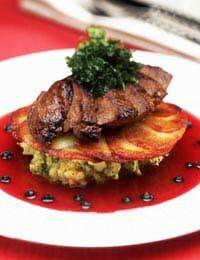 Try making a garlic mash, for example, or serve venison steaks with a parsley puree and turnips.